A Private Rocket Likely Failed in Alaska — Why Is It Still Considered a Success? The launch pad at the launch facilities at Pacific Spaceport Complex in Alaska on Kodiak Island. The California-based company Astra Space launched "Rocket 1" from this site in July 2018. A new rocket probably failed soon after launch — but that isn't necessarily a bad thing. On July 20, the California-based company Astra Space carried out a suborbital launch of its "Rocket 1" from the Pacific Spaceport Complex on Kodiak Island in Alaska. The rocket took off in foggy conditions, so there wasn't much to see, but the launch could still be heard, according to local reporter Gabe Stutman. But other than the fact that Rocket 1 launched, no one seems to know what happened next. Space.com spoke with Jonathan McDowell, an astronomer at the Harvard-Smithsonian Center for Astrophysics who diligently tracks many of the objects that launch from Earth and orbit it, about this launch and the mysterious case of Rocket 1. McDowell says he thinks that whatever went wrong with Rocket 1 likely happened close to the launch site, based on the word "mishap" in the statement from the FAA. McDowell expanded on this, saying that, for example, if "your second stage doesn't burn as long as it was meant to and you fall short of your target, that's not a mishap, that's an underperformance." 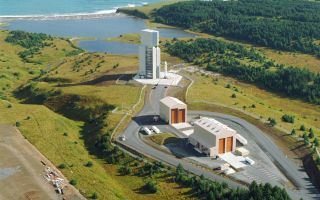 Launch facilities at Pacific Spaceport Complex in Alaska on Kodiak Island. While we do not know exactly what happened to the secretive launch of "Rocket 1," some think that it likely failed close to the launch site. There are a number of things that could have happened to Rocket 1. Obviously, the "most dramatic way is yeah … it blew up," McDowell said. But, he added, there are many other plausible outcomes — a rocket's engine can just shut down, leaving the rocket to fall to the Earth (and then blow up); the guidance system can fail, causing the rocket to be detonated remotely before it crashes near people; the nose cone can collapse, causing structural failure. Other possible problems he noted: the rocket can lack thrust, leaving it to fall into the ocean just a couple of miles offshore; and the second stage and the nose cone can both fail to separate. There are a number of explosive and benign ways that a launch can "fail," he said. But "failure" isn't necessarily a bad thing, McDowell said. "Even if you get 10 seconds of propulsion data … that can still be a very good result … you can still be legitimately very happy with that. "So even if the rocket is in the air for only 10 seconds, you can still get a ton of data on how the engine and all the rocket's different systems perform, McDowell said. This data can be instrumental in ensuring your next rocket has fewer issues. Also, McDowell added that, because the Rocket 1 is "a completely new vehicle, a completely new design, never flown before," Astra Space perhaps wasn't even expecting the rocket to land intact. He cited SpaceX's first few launches, all of which "failed," for how these complex rockets usually take a few less-than-perfect tries before a launch is a complete success. So, while we don't know exactly what happened to Rocket 1, it makes sense that Astra Space is still happy with this mysterious Alaska launch because, as McDowell put it, "all you really want to get is enough data."